The summit is scheduled to take place from 30 to 31 January 2016, in Addis Ababa, under the theme “2016: African Year of Human Rights with particular focus on the Rights of Women ”. President Jacob Zuma will lead a South African delegation to the 26th Ordinary Session of the Assembly of the African Union (AU). The year 2016 marks important milestones in the continental and global women’s agenda for gender equality and women empowerment. “Human rights, especially women’s rights, remain a cornerstone of South Africa’s legal framework and policies, such as the National Development Plan, which is in line with the AU Agenda 2063 Vision that there will be gender equality and women’s empowerment in all spheres of life,” said South Africa’s Minister of International Relations and Cooperation, Maite Nkoana-Mashabane, recently at a media briefing. The summit will look into the status of peace and security in Africa, particularity the readiness of the multidimensional African Standby Force (ASF) and its Rapid Deployment Capability for Sustainable Peace, which the AU hopes will be operating this year. The establishment of the ASF is seen as a step towards curbing reliance on foreign powers, whose forces are deployed in Africa’s conflict zones, which often causes tensions as African leaders seek African solutions for African problems. Minister Nkoana-Mashabane said the summit would also look into the financing of the union, especially in the tough economic times. The leaders will be looking at ways to manoeuvre the economic crisis while not compromising their notion of African solutions for African problems. The summit, according to Minister Nkoana-Mashabane, will also look into issues of governance, elections and constitutionalism, as well as the implementation of the New Partnership for Africa’s Development projects and the African Peer Review Mechanism. The continent’s hotspots like Burundi, Libya, South Sudan and the Democratic Republic of Congo as well as terrorism will also receive attention. 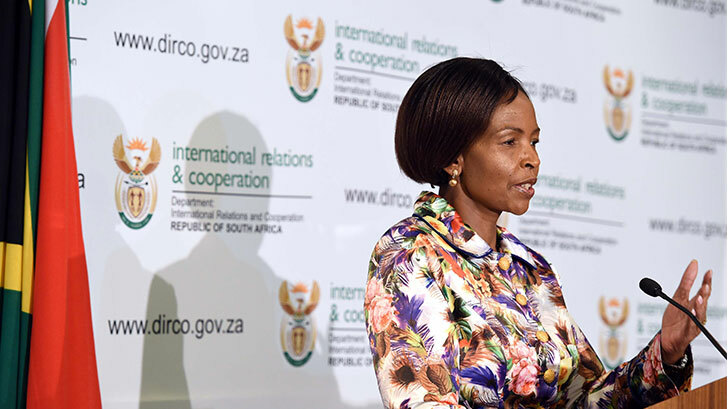 Asked about the AU’s role in Burundi, Minister Nkoana-Mashabane said the AU had proposed the deployment of an African Prevention and Protection Mission in that country. President Jacob Zuma led a high-powered Team South Africa delegation and delivered the message that South Africa was open for business to global investors and other stakeholders. 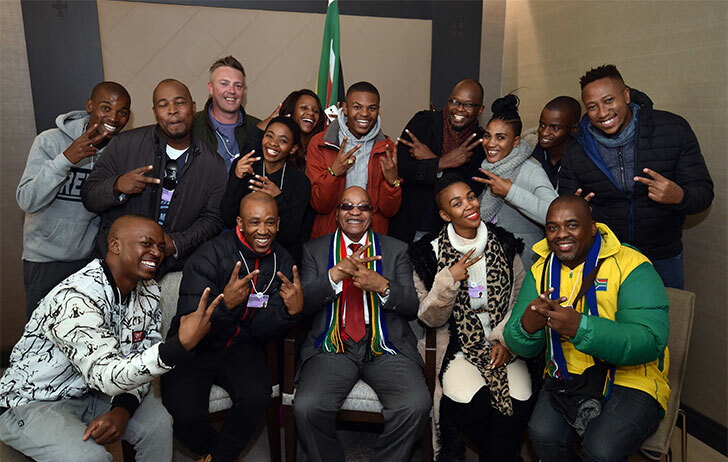 Team South Africa recently concluded a successful programme at the WEF 2016 in Davos, Switzerland, says The Presidency. The delegation to Davos included Minister in The Presidency for Planning, Monitoring and Evaluation, Jeff Radebe; Finance Minister, Pravin Gordhan; Trade and Industry Minister, Dr Rob Davies; Economic Development Minister, Ebrahim Patel; Water and Sanitation Minister, Nomvula Mokonyane; Energy Minister, Tina Joemat-Pettersson; and the Minister of Health, Aaron Motsoaledi. Team South Africa also included the Governor of the South African Reserve Bank, Lesetja Kganyago, and captains of industry from various business sectors. Team South Africa leveraged the presence of international business, analysts and politicians in Davos to assure the global community of the country's commitment to maintaining policy certainty, fiscal discipline, macro-economic stability and the promotion of inclusive growth and development. “South Africa reiterated that the National Development Plan, the nine-point plan for economic recovery and Operation Phakisa were being implemented with a view to ensuring economic and social growth and development. “The current global economic challenges require South Africa to develop a robust and responsive set of measures to ensure economic stability. The message was advocated by Team South Africa consistently to delegates in Davos,” The Presidency said in a statement. During the forum, Team South Africa had high-level interactions as well as bilateral discussions. President Zuma hosted global investors during a session of the Business Interaction Group on South Africa. During this session President Zuma emphasised South Africa's commitment to policy certainty by announcing the establishment of the Inter-Ministerial Committee on Investments and a one-stop interdepartmental clearing house to facilitate support for investors. With particular reference to the theme of Davos 2016, "Mastering the 4th Industrial Revolution", Team South Africa emphasised the need to create a balance between the use of technology to mechanise and industrialise to move the economy into a knowledge state of human development and job security. The two leaders discussed the warm and strong bilateral relations between the two countries which date back to the period of the struggle against apartheid when Sweden supported the oppressed in South Africa to gain freedom and democracy. President Jacob Zuma met with Prime Minister Stefan Löfven of the Kingdom of Sweden on 21 January 2016, in Davos, Switzerland, on the margins of the World Economic Forum meeting. The two leaders discussed the need to further strengthen South Africa-Sweden bilateral relations, which are structured through a bi-national commission that is chaired by Deputy President Cyril Ramaphosa and the Prime Minister. 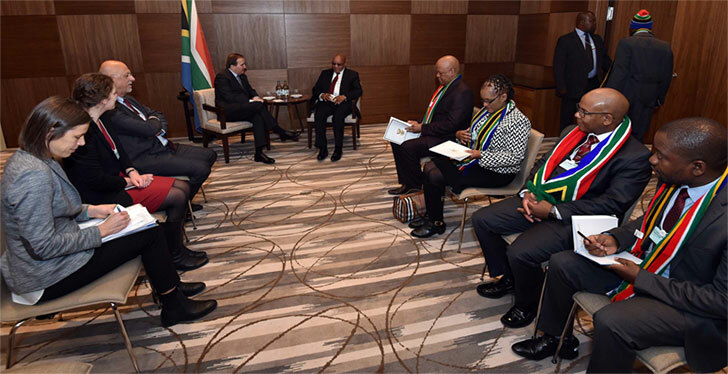 President Zuma and Prime Minister Löfven discussed the need for further cooperation in the economic and social development areas, with special emphasis on education and skills development. The two leaders also discussed the implementation of the 2030 Agenda for Sustainable Development, which was adopted by the United Nations General Assembly in September 2015. Prime Minister Löfven has invited President Zuma to join an informal group of world leaders from different regions to support the implementation of the sustainable development goals at the highest political level. The Memorandum of Understanding (MoU) also seeks to foster mutually beneficial relations and stimulate private-sector interest as well as involvement to cooperate in the development of economic activities in the respective countries. 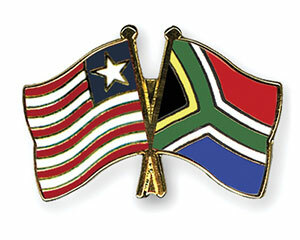 South Africa and Liberia have signed a MoU that seeks to create a legal framework to improve trade and economic relations between the two countries. The Liberian delegation was hosted by the Deputy Minister of Small Business Development, Elizabeth Thabethe, in Pretoria recently. Liberia’s delegation was led by the Deputy Minister of Commerce and Trade responsible for Small Business and Administration, Andrew G Paygar-Flangiah, while Deputy Minister Thabethe was supported by the Department of Trade and Industry as well as the Small Enterprise Development Agency (SEDA). The Liberian delegation was in the country for about a week, conducting a study tour on small business development with a particular interest in SEDA’s incubation support programme, including pre- and post-support. South Africa stands firmly with the African Union and the rest of the international community in condemning these senseless attacks targeting innocent civilians and reiterates its stance that terrorism, in whatever form and from whichever quarter, cannot be condoned. The South African Government strongly condemns the cowardly and barbaric terrorist attacks that took place at Lido Beach in Mogadishu, Somalia, on Thursday evening, 21 January 2016. The attacks resulted in the deaths and injuries of scores of innocent civilians. On behalf of the Government and people of South Africa, President Jacob Zuma has conveyed a message of deepest condolences to President Hassan Sheikh Mohamud, the Federal Government and people of Somalia, and most particularly to those injured and the families of the victims. South Africa remains committed to supporting Somalia through capacity- and institution-building projects and calls on all groups and individuals who remain outside the political process to renounce violence, desist from cowardly acts of terrorism and join the peace-driven political processes of reconciliation to ensure the development and prosperity of Somalia. The membership of the OGP has grown to 69 countries, with hundreds of civil-society organisations participating in the process at country-level since its establishment in September 2011. South Africa’s Special Envoy to the OGP and Deputy Minister for Public Service and Administration, Ayanda Dlodlo, recently hosted a Governance and Leadership Retreat as new Chair of the OGP Steering Committee. The Governance and Leadership Retreat was attended by the four chairs of the OGP Steering Committee, which is South Africa, France and two representatives of civil society. The retreat took place on 20 and 21 January 2016 at Lilieslief Farm and Museum. Issues that were addressed at the retreat included the priorities of the OGP co-chairs for the year ahead, including the envisaged event marking five years of the OGP that will be hosted by President Jacob Zuma on the margins of the United Nations General Assembly in 2016 and looking to improve ways of working of the OGP structures. The OGP Steering Committee is constituted by representatives from both civil society and government from across the globe. Governments represented on the OGP Steering Committee include Brazil, Croatia, France, Indonesia, Mexico, Philippines, Tanzania, United Kingdom and the United States, with the Steering Committee also receiving participation by members of several civil-society formations. OGP countries represent one-third of the world's population and have made more than 1 000 open government reform commitments. The Presidency said the fully-fledged InvestSA service and One Stop Shop (OSS) would be launched later this year. President Jacob Zuma has established an IMC to improve support and assistance to investors wishing to invest in South Africa. The Presidency said recently that potential investors complained about the time they had to spend visiting different government departments and institutions to fulfil regulatory requirements and the need to simplify the regulatory framework, among others. President Zuma in 2015 announced an InvestSA approach and the OSS concept and work has begun towards the establishment of the critical service. “Trade and Industry Minister, Dr Rob Davies, has created a division at the Department of Trade and Industry (dti) to focus on investment promotion, facilitation and aftercare. “He is also adding capacity to the facilitation and aftercare unit to create a clearing house and to roll out one stop shops in all provinces. Investors are encouraged to contact the dti for the pilot service,” said The Presidency. The One Stop Shop concept requires support from all government departments. The President has thus decided to expand the current IMC on Bilateral Investment Treaties to include a focus on South Africa’s investment climate across all areas of government in a coordinated and cohesive manner,” said The Presidency. Both countries agree on the importance of further promoting knowledge about the role of culture for sustainable development and in promoting tolerance, dialogue, freedom of expression and the democratic development of the society. 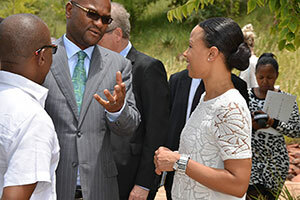 The Minister of Arts and Culture, Nathi Mthethwa, met Swedish Minister of Culture and Democracy, Alice Bah Kuhnke, on Monday, 25 January 2016, at Freedom Park in Pretoria. Minister Bah Kuhnke is responsible for democracy, the national minorities, civil society, the language and culture of the Sami people, discrimination, culture, media, human rights at a national level and faith communities. The two ministers discussed collaboration on various initiatives, including the “Time Travel” project coordinated by the Kalmar County Museum in Sweden, which is a heritage education partnership that focuses on the use of local history and how this knowledge is used to benefit the local community. This project is active in Gauteng, KwaZulu-Natal, the Northern Cape and the Western Cape and includes several institutions, among them, Freedom Park, Constitution Hill and the Hector Pieterson Museum. Cooperation on projects between the Nordic Africa Institute and South African heritage institutions was discussed as well as Swedish participation in the Liberation Heritage Route as Sweden played an important role in the struggle against apartheid. Cooperation on the promotion of a culture of reading and the fostering of social cohesion were also be explored. The JSE said the new office in the city would enhance its service to clients, build and strengthen relationships and provide accessible support to the market. 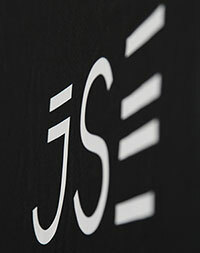 The JSE recently announced that it was opening a new office in Cape Town. According to the JSE this is because Cape Town is becoming an increasingly important hub of South Africa’s financial services industry. “Cape Town is a major centre for global and local institutional investors as well as listed companies. Being the second-largest economic hub of South Africa, the head office base of many institutional clients and an increasing number of member firms and brokers, an office in the city is a logical part of the JSE’s client strategy,” explained capital markets director Donna Oosthuyse. 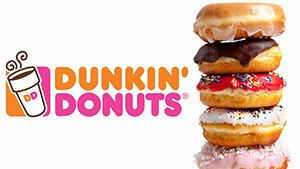 America’s Dunkin’ Brands Inc has signed a franchise agreement with Grand Parade Investments (GPI) Ltd to open more than 250 Dunkin’ Donuts and more than 70 Baskin-Robbins food shops in South Africa, focusing on Cape Town and Johannesburg. The leading United States brand also said it would launch Baskin-Robbins ice creams at South African supermarket chains and convenience stores. “As we continue our global expansion of Dunkin’ Donuts and Baskin-Robbins, we are delighted to work with GPI to bring both brands to South Africa,” Bill Mitchell, President, Dunkin’ Brands International, said in a statement. “GPI has a wealth of experience in the local restaurant and retail industry, and a strong focus on operational excellence. "The Rivonia generation symbolises the best values of the liberation movement, including selflessness, courage and providing leadership by example," said Neeshan Balton, director of the foundation. 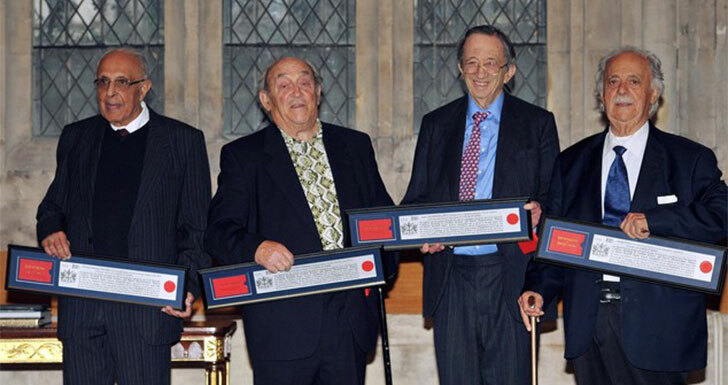 Former Rivonia trialists were in the United Kingdom this week to receive the Freedom of the City of London. Ahmed Kathrada, Andrew Mlangeni and Denis Goldberg were joined by their legal representatives, George Bizos and Joel Joffe, to receive the award in recognition of their fight for freedom and racial equality. The Freedom of the City of London, believed to have begun in 1237, is conferred on individuals by the City of London Corporation to "help celebrate a significant achievement, or to pay tribute to their outstanding contribution to London life or public life". They met Prime Minister David Cameron and made various appearances. "The Freedom of the City of London is the highest recognition that the city can give to a citizen of the UK or an outsider ... For Mr Kathrada it is an honour especially to be receiving it among the remaining Rivonia trialists," said Zaakirah Vadi, spokesman for the Ahmed Kathrada Foundation. Past recipients include Princess Diana, Morgan Freeman and Winston Churchill. The performance showcased South African culture and heritage through a musical journey infusing musical sounds and rhythms. The Minister of Arts and Culture, Nathi Mthethwa, has congratulated Mafikizolo on their invitation to perform at the WEF Annual Meeting 2016 gala dinner in Davos, Switzerland, recently. “I wish to congratulate Mafikizolo on this invitation to perform on this world stage. Their music and style cross boundaries on the African continent and abroad. “While the forum focuses largely on the state of the world economy in order to shape the global and local developmental agenda, it also showcases arts and culture in the world,” said the Minister. The group was invited by Professor Klaus Schwab, founder and Executive Chairperson of the WEF, after he admired their performance during the WEF Africa Regional Meeting in June 2015 in Cape Town. The Minister hoped this would open many other doors and present platforms for South African artists in the global arena. The performance was supported by the Mzansi Golden Economy Touring Ventures open call fund of the Department of Arts and Culture. This aims to raise the profile of the arts, culture and heritage sector within the country and abroad in an effort to share South African arts and culture with others, open up new markets and build sustainable livelihoods for those in the creative industries. A South African student filmmaker has been shortlisted for the Student Oscars. Nathan Rice, a third-year AFDA student, has been nominated for the Student Academy of Motion Picture Awards in the Best Short Foreign Student Film Category. 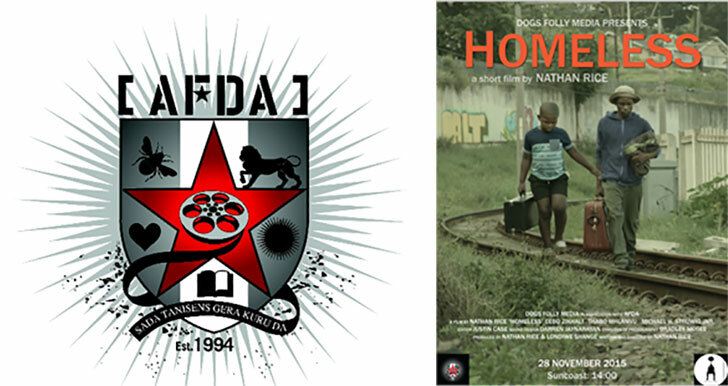 The film, titled Homeless, tells the story of a young man and his younger brother who are forcefully evicted from their shack. Rice has been nominated for directing and screenwriting. The film will also be AFDA’s nomination for the CILECT prize, the largest and most prestigious international association of film and television schools. "The Telegraph" noted in its introduction that many great hotels in the world – such as George V, Carlyle, Cipriani, Mandarin Oriental Hong Kong – did not make the list, showing how “fabulous” the properties were that it’s numerous panelists had chosen. The luxurious boutique hotel Ellerman House, overlooking Bantry Bay in Cape Town, has joined 49 illustrious other hotels around the world in the latest “50 Greatest Hotels” named by the British Telegraph newspaper. 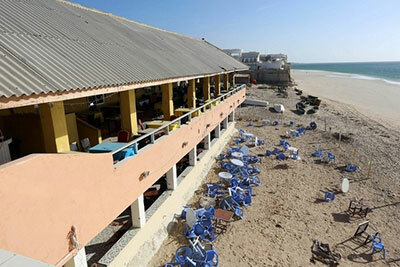 The three other hotels in sub-Saharan Africa that made the list were designed, owned or managed by South Africans. They are Wilderness Safaris’ North Island in Seychelles, Mnemba Island Lodge belonging to andBeyond in Tanzania, and Singita’s Sasakwa Lodge near the Serengeti, also in Tanzania. The Telegraph said about Ellerman: “Perched high above the Atlantic, in a 1,5-acre terraced garden carved out of the Bantry Bay cliffs, Ellerman House enjoys perhaps the most spectacular location in Cape Town, a city not short on views. "With just 13 rooms and suites sharing the sprawling grounds, and outsiders welcome by prior arrangement or guest invitation only, Ellerman House is also the most private hotel in the city, a secluded retreat with the kind of hushed atmosphere that suits the many regular visitors who treat it as their Cape Town home.